Torquay, as everyone knows, is only famous for Fawlty towers, Agatha Christie and saga coach tours. Visit there however, and it is easy to see how it received the nickname ' the English Riviera'. An incredibly picturesque town in parts, the climate is definitely more like its continental namesake than most other seaside resorts in the UK. Although my photos don't really show it, Torquay was bathed in sunshine for most of the day I visited Simon in May. I have known Simon for a long time- I wont say how long, but when we met I fitted in 32" trousers and Simon had long hair- and following a meal at Dinner by Heston we had enjoyed previously, I was invited to visit the elephant and sample the food Michelin have rewarded with a coveted star since 2006. This would be the first time eating Simon's food for me, and I was looking forward to it, having seen his dish at Kaiwecare which in my opinion was one of the best of the night. Arriving in the restaurant, it is an inviting place, with several pictures of an elephant in various surroundings ( I presume around Torquay), as well as little elephant statues (one of which @satbains1 recently pinched and took photos of in some of the restaurants he visited on his latest culinary tour!) and images of the beast etched into tables. With a nod to the towns seaside resort fame, there are figures of crabs, seagulls and beach huts on the tables, giving each one an identity. (on my table was a pink beach hut with a seagull). The real star of the show, as it should be in a restaurant of this standing, is the food. After a few nibbles- olives, and some fine bread with olive oil, butter or pork rillettes with crackling- we moved on to the opening course- Simon's famous 'beetroot, elderflower, vulscombe goats cheese and tansy'. This was the kaiwecare dish which stole the show, and it was a stunner. Each component was perfectly assembled, had clean flavour and was perfectly seasoned. The elderflower curd gave a hint of sweetness and the saltiness of the goats cheese added to the depth of flavour which can sometimes be tricky to balance with the potent beetroot. As good an opening course as I can remember, and a real indication of what lay ahead. Moving on, I was next treated to 'Devon crab, cucumber, watermelon,fritter, ketchup, lovage'. 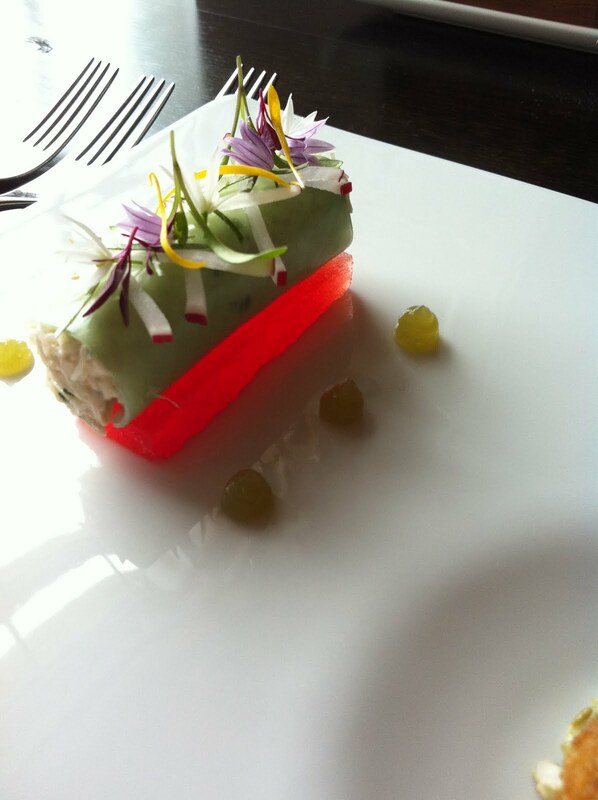 Another highly visual dish, succulent white crab was assembled atop a piece of compressed watermelon and wrapped in a cucumber jelly with batons of radish. a cucumber ketchup decorated the plate and added umami to the experience. the fritters of brown crab meat were tasty in a mild way that is hard to achieve with brown crab, which can overpower the tamer white sometimes. The tartare sauce which the fritters rested on was the only unnecessary element of the dish for my liking, but even that was done perfectly. After the crab came 'ham hock tortellini, toffee pea, salted pecans and shoots', a sweetened pea soup, with a deliciously moist ham tortellini sat in it. pea shoots garnished and added another fresh pea taste to the dish, and the salt pecans was a great touch, again balancing the experience. Back to seafood for the next course-'bay scallop, cabbage, lemon confit, risotto'. a single but enormous scallop was the centrepiece, and it was exactly how I like my scallops- just caramelised on the outside, and still translucent inside. The beautiful mollusc was nestled on a lush, rich risotto and creamed savoy cabbage which was so finely shredded it must have cooked in moments, which would explain the fresh taste and perfect texture. The lemon confit giving just a hint of sharpness to help cut the creamy risotto, and the light lemon foam was the ideal 'sauce' for such a delicate dish. Following Simon's brave effort in Lyon in the Bocuse d'or this January, I'm sure many of us are familiar with his fish dish for that competition, a variation of which was my next course- 'halibut, parsnip, lardo, verjus, spring onions, golden sultanas, flowers'. Obviously the dish for Bocuse was a lot more complex, but the similarities are there. I was fortunate to be one of the tasters at one of Simon's run through's before Lyon, and this was every bit as tasty. the un-named sweetbread beignet gave an earthy kick to the dish, and the verjus and the sultanas were a sweet-acidic marriage made in Devon... Seriously though, a lovely dish, and one which I am sure many will have watched being cooked on Saturday kitchen back in January! getting fuller by the mouthful at this stage, I was glad of the slight pause in proceedings when Simon came out of the kitchen to have a bit of a chat. Despite having only spoken to him on a few occasions since working together all that time ago, chefs always stay the same and Simon is exactly as I remembered him- confident, borderline gobby and very giving. He has a great team working for him, and he is full of praise for them and how they helped him get through the periods where he struggled to get around the kitchen after his recent accident, where his beloved Lambretta had a blow-out and he fractured his leg and wrists. Must be a great boss too, as he has had his team together for a while now. the break over, we continued with 'duck, celeriac, pak choi, spiced honey, pain d'epices'. The succulent duck breast had everything- depth of flavour, sweetness, crisp fat and a moist flesh. You have to gauge any chef by how well he does the simple things, and cooking duck is easy to get wrong, yet many chefs do just that. In this dish, Simon again shows respect for the ingredient and only does anything to them which improves, no technique for technique's sake here. The garnishes were all superbly executed and worked incredibly well on the plate, and even on the side dish of crispy duck tongue salad. Desserts up next, and although simple looking, the 'cheesecake, passion fruit, honeycomb, citrus' was every bit as tasty as the rest of the meal, a lovely balance of sweet cheesecake, and acidic citrus and passion fruit, with the texture of the honeycomb just right for the creaminess. My final course was 'treacle tart, marmalade, milk, clotted cream'. As Simon put it-'everyone likes different things with their treacle tart, so we give them the choice'. Again, technically spot-on, each component was good, from the silky smooth milk sorbet, the textured marmalade and the 'presumably' local clotted cream to the tart itself. pureed to remove the texture of the breadcrumbs, this had all the flavour I remember my Nan's treacle tart having with fondness. All together, this was a very accomplished meal, and the food of a happy chef with a strong brigade behind him. Putting our connection to one side, knowing that the dishes I tasted were directly from the menu and not specials assembled to impress shows the talent here. Simon and the Elephant can only keep growing, as his reputation spreads and more people realise that there is more to Torquay than Basil Fawlty. thanks brett, glad to hear it! !